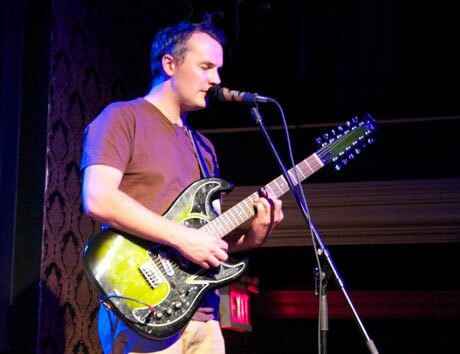 Themes of nature and existentialism from Mount Eerie's two new records, Clear Moon and Ocean Roar, came alive at Toronto's historic Great Hall venue on Monday night. Prior to Phil Elverum's performance with a full band as Mount Eerie, though, there were two innovative opening acts to get things going. Local thinker and musician Steve Kado began the evening with his "2003" composition. Eight guitars, a bass and two keyboards twined together in an unusual 1/1 time signature. After over a half-hour of hypnotic repetition and only minor variations in a rigid frame, Kado announced with tongue-in-cheek, "Welcome to this year's Bonnaroo. We are the Dave Matthews Band. Up next is Phish." Wyrd Visions, the stage name of Colin Bergh, followed wielding a double-neck guitar and performed a seamless segue of his mystic and gloomy folk songs. Using loop pedals, he fashioned himself into a one-man chorus of medieval monks. On closing number "Bog Lord," from his 2009 album Half-Eaten Guitar, his otherworldly lyrics resounded throughout the Great Hall and succeeded in affecting even some of the more chatty members of the crowd. When Elverum finally came onstage, his endearingly awkward demeanour and polite banter only served to cement his reputation as an indie icon. He started things off with an assortment of songs from Clear Moon, the first of the pair of albums he put out this year. Strumming a 12-string guitar, he led the audience into his singular world. "Through the Trees pt. 2" evoked the sense of being lost and confused in a shadowy forest, while "The Place Lives" and "The Place I Live" felt like sitting in a warm house as raindrops splatter on the window. Although at times the band created a robust sound with rumbling walls of feedback, Elverum stayed true to his pioneering lo-fi work with the Microphones and never allowed the noise to become overblown. After the Clear Moon portion of the set, a surprise highlight came as the backing group took a break and he invited iconic Canadian songstress Julie Doiron up to play "Flaming Home" and "Grave Robbers" from their 2008 collaboration, Lost Wisdom. The show came to a close with a few Ocean Roar selections, and through the line "Totally at peace with the meaninglessness of living" on "I Walked Home Beholding," Elverum demonstrated his ability to match transcendent poetry with equally potent music.